Golf is a game and it should be fun. The best advice given to any potential golf teaching professional is to structure your golf lesson, regardless of what facet of the game you are teaching, around the fact that the game is meant to be enjoyed. The golf teacher who has the ability to let his/her personality come out, loosen up their students, and perhaps even get them to laugh a bit, is worth their weight in gold. The most successful golf teaching professionals seem to be the ones who have the most fun with their students. Speaks for itself. As an ambassador of the game and the United States Golf Teachers Federation, your personal appearance should always be impeccable. A picture is worth a thousand words. If you explain something to someone, follow it up with a demonstration, then have your student try it. All explanations should be followed with a visual golf teaching demonstration. Go hand in hand. If you detect an error, a correction naturally has to go along with it. Detection of errors should be chosen wisely. For instance, if a student has a horrendous grip along with all kinds of other problems, you would naturally want to make a change with the grip right off the bat and not even mention the other problems. Initially, if a student has a pretty good grip, but perhaps an extremely narrow stance with a driver along with a multitude of other problems, you would want to key in on correcting the stance: “The stance is a little too narrow, try widening it a bit, Jim.” In one sentence you have not only detected the error, you have corrected it as well. Words should be chosen carefully, kept to a minimum and limited to the task at hand. As you know, there are hundreds of golf drills and exercises that can help the golf student. With this information available, it is very important, when introducing a drill to explain not only what the drill is, but also how it is going to help the student’s particular problem area. Because of the nature of the game of golf, the ability to encourage a student is very important. People are more relaxed and able to improve if they are consistently encouraged rather than criticized. For every “error” you may find in someone’s golf swing, let them know of two things they are doing correctly. Did My Golf Students Enjoy Themselves? Try asking yourself this simple question at the end of each day. If the result is positive, your reputation as a golf teacher will soon become known and you will ultimately become more successful at your profession…teaching golf. Learn your students’ names and use them. Find out something about them and talk about their interests. Look at them when you are talking to them. Make sure everyone gets some individual attention. The students will expect to have their needs met, not necessarily yours. You will be communicating with your behavior, too. A pleasant, positive, enthusiastic manner will rub off and have positive effects on your students. Remember that you are in the service industry and the first mark of a golf teaching professional is respect for the client. It takes more patience to be a student than a golf teacher. Learning can be frustrating at first; therefore, one of your most important jobs as a golf teaching professional is to reduce frustration so that learning can continue. Be alert for those who are frustrated or embarrassed. Try to remember how you felt when you were learning. The most congenial golf teaching professional will have limited success if he does not know what he is doing. Golf teachers need to have considerable depth of knowledge to be able to analyze the performance of their students and to give helpful, meaningful feedback. In all golf lessons, the golf teaching professional must set achievable goals, make progress with the student and leave the student with a sense of accomplishment. A personable approach is important. Find our about your students, what they want to learn, etc., and be a good listener. 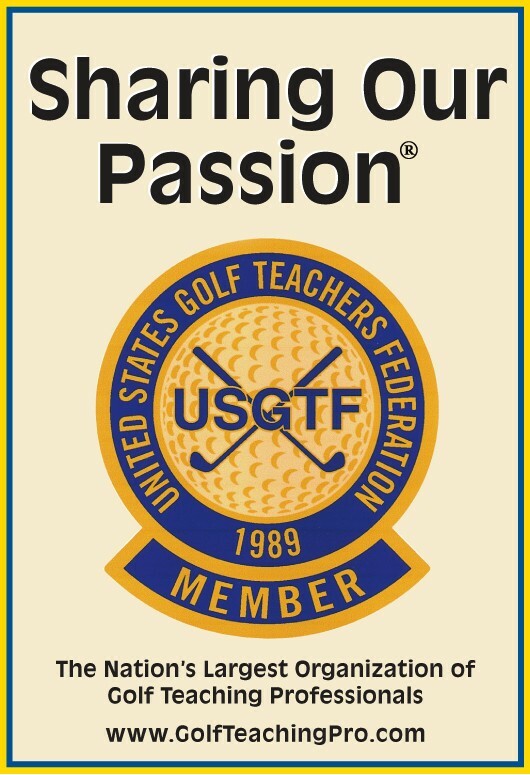 The most successful golf teaching professionals are organized, service oriented, and understand the concept of building clientele. Teaching golf well is an art and can be a very rewarding one. Use humor when teaching golf. Show, rather than tell, at every opportunity during the golf lesson. Remember that fear of failure can be reinforced by paying too much attention to mistakes. Most people become discouraged and less receptive to learning if the lesson becomes a list of things they should not be doing. Continually praise your students on any success they may achieve. Look just as hard for the “right” things as the “wrong” things. This will create smiles and help eliminate frustration. When working on a drill or exercise, immediately relate it to the part of the swing that it was intended for. If someone is not learning, someone is not teaching golf. If the student is smiling, you are making progress. Every golf lesson can be a learning experience for both the golf teacher and the golf student. Enthusiasm is contagious – let yours show. A positive attitude can make the golf lesson more rewarding for both the golf teacher and student. Be fun to be with. Every effort should be made to end the lesson on a positive note. Take a moment to thank the student and give a few encouraging words. It will be time well spent.